Home > SEO > Why And How to Add Nofollow Tag To A Link For SEO? We always put some links in our blog posts as resources or for any good reasons. But sometimes we don’t know the link’s URL whether it is search engine friendly or banned or we don’t want to rank them high from our given links. Well, here “NoFollow” tag helps. NoFollow tag created by Google, Yahoo, Microsoft and other major blogging platforms in January, 2005 to reduce and fight with link spamming and in September, 2015 Google strongly recommended to use NoFollow tag for Paid links. When a search engine bot scan a website it can read your all links HTML tags whether it should follow or no follow. So, it is really important to know the when and how to add NoFollow Tag to a link for SEO. READ ALSO: How To Get Approved Blog Comments For Link Building? Why should add NoFollow Tag to a link for SEO? To reduce huge comment spam who wants to make just link building. To reduce passing link juice to any other sites. If you think linking sites are not user friendly or bad reputed domain. To get good guest posts from authors who actually doesn’t want to building links only. To protect your overall site ranking. To inform search engine robots which page or links are good or bad and which page should be ranked or not. When you want to use paid links on your site. Such as: Paid ads and traffic, affiliate links. If you want to embed something then use nofollow tag in links. Such as: videos, widgets or infographics. READ THIS: How To Submit Your Site In DMOZ Directory? Now, to make this link nofollow, simply add just NoFollow attribute in the link code. If you use wordpress or blogger platform then you will find an option to add NoFollow tag to a link. You can also add Nofollow tag to a link for SEO manually in these blogging platforms. 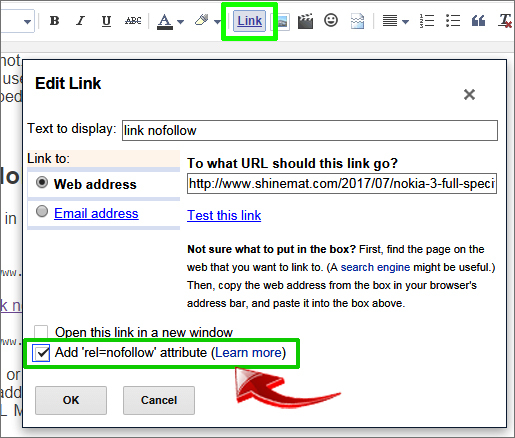 Just go to Edit HTML Mode and add the NoFollow attribute code to links that you want to make NoFollow links. That’s all dear friends. Do let me know, if you have any questions regarding this post. Also tell us how much this post helps you to learn how to "add NoFollow tag to a link for SEO". We are waiting to hear from you. Happy blogging pals. Allah Hafez.